Another Vintage Motorcycle Days (VMD) event has come and gone, and it was great as always! The weather this year was as perfect as one could expect, at least for a field in the middle of Ohio in the summer. VMD is produced by the American Motorcyclist Association, and is the largest—to my knowledge—vintage motorcycle event in the United States. 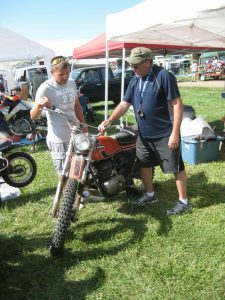 VMD is held at the beautiful Mid-Ohio Sports Car Course in Lexington, Ohio, and is a “must-do” event for vintage bike enthusiasts. Among the attractions at VMD are the Swap Meet (encompassing about two football fields of display area), vintage racing (track and off-road), motorcycle displays (by current manufacturers and vintage organizations), live music, workshops, and a variety of other events. 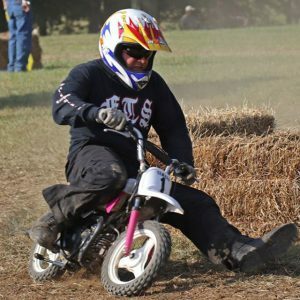 The largest activities/groups are the Swap Meet vendors and the vintage racers (sharply divided between the more sedate, upscale road-racers and the off-road racers, camping and racing at opposing ends of the Course). As one would intuitively understand, perhaps the most important attraction during the event would be the presence of yours truly, the Vintage Motor Company! That’s right, your favorite vintage bike clothing company has our own stand set up inside the swap area. We sell our hand designed t-shirts, the very ones you can find in our shopping section here. VMD can also be characterized as a “non-Harley event.” Now, nothing against Harleys or Harley riders (many old bike folks have Harleys and enjoy them. incidentally), but it’s also refreshing to see a bike meet that doesn’t have so much of the “biker lifestyle” thing going on. It’s not that VMD doesn’t have its share of tattoos and black Harley-dealer t-shirts; it’s just that this identity is not THE defining characteristic. Pursuing VMD’s own identity, one might also think of VMD as very much devoted to highlighting the history off-road competition and machinery—something which often takes a back seat at contemporary vintage motorcycle meets. In fact, if you are into vintage dirt bikes, VMD will be especially interesting to you. More Vintage Bike Events than One can Imagine! Attendees can either pay by the day for the Friday, Saturday, and Sunday event, or purchase an all-weekend pass ($45 in advance). If you plan to attend the event, here are some ideas I can offer, based on our experience. *Camping. There are several locations one can camp. Swap Meet vendors often camp on their 20 foot by 20 foot spots (as Christian and I do). 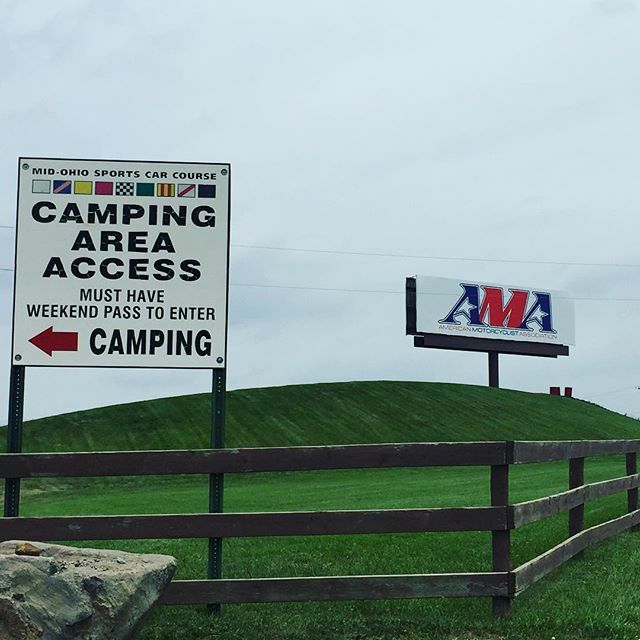 There are also camping sites near the motocross courses and along the northeast entrance road, and camping is also allowed in the parking field. Camping at VMD can be advantageous in a couple of ways: first, it saves money; and, second, it eliminates time spent transitioning between VMD and one’s motel. (If you’re as into VMD as some of us are—walking the aisles, talking, and buying from early morning till evening—this becomes a notable advantage.) The showers on-site are acceptable, and, if one seeks them out, alternatives to Port-a-Potties can be located. There are plenty of food vendors on-site, and taking a run to town for a real dinner is certainly not any great hassle. Typical vendor spot among the many hundreds in the swap meet area. If your looking for it, it’s here somewhere. If you really want to be around the Swap Meet, as many collectors, buyers, and restorers do, purchasing a vendor spot ($100 for AMA members) may be the most economical and convenient option. The major disadvantages to camping at VMD are: the desire to escape the summer heat of the day, Port-a-Potties (see footnote1), and the presence of riders on loud motorcycles driving around till about 10:00pm. *Motels. Motels are certainly an option for VMD visitors, and they are reasonably easy to obtain. Unlike several years ago, when it seemed every motel within 45 minutes was booked, many attendees say they have little trouble obtaining a room in Lexington or nearby Mansfield, even the week prior to the event. Be aware, though, that the area motels increase their rates during VMD. Rooms in mid-level motels will run between about $85 and $170 a night. *The town of Lexington. The Mid-Ohio Course is located about a mile outside Lexington, a pleasant, small Ohio town with grocery stores, restaurants, a Tastee-Freez, beverage marts, and even some nice antique stores—if you can ever get away from the meet. *Vintage Racing. The vintage racing at VMD goes on nearly continuously from 8:00am to the late afternoon, each day. Fans will have no problem getting close to the action at either the road-race or dirt events, and can freely mingle into the pits and racer’s camping areas all day long. *Shopping for old bikes and parts. VMD is dream come true for those looking for old bikes and parts! One can easily spend multiple days in thoroughly going through the Swap Meet area; if fact, due to vendors arriving at different time and bringing in replacement inventory, buyers benefit by covering the same ground multiple times. (A common VMD expression: “You found that where? I didn’t see that!”) The Swap Meet isn’t the only location, either. 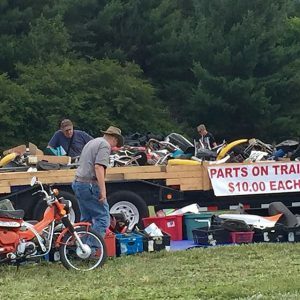 Sometimes the best deals are found at the racer camping/pit areas, as many competitors bring items along to sell (and are more intent on discarding excess bikes and parts than making maximizing profit). And don’t forget to check the parking areas; participants and vendors often park their trucks and trailers with great bikes in the back, with a cell phone number for those interested to call. 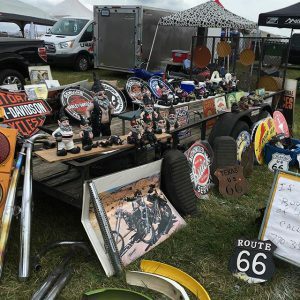 For shoppers at VMD, it’s definitely a “buyer’s market.” Not only does every imaginable motorcycle item find its way there, but prices can be exceptionally low. By Sunday morning, sellers are ready to rid themselves of dead weight, and great deals are made! Rolling away a non-running but complete and very restorable 40-year-old motorcycle for $300-$500 is not uncommon. For more information regarding the American Motorcyclist Association and VMD, you can access their website here. Give VMD at try next year. You’ll not regret it! Something you need is in here. “Rule Number One” of VMD camping is: Let no part of a Port-a-Potty touch one’s body. This entry was posted in Motorcycle Culture, vintage motorcycle days and tagged Vintage Bike Events, vintage motorcycle days.